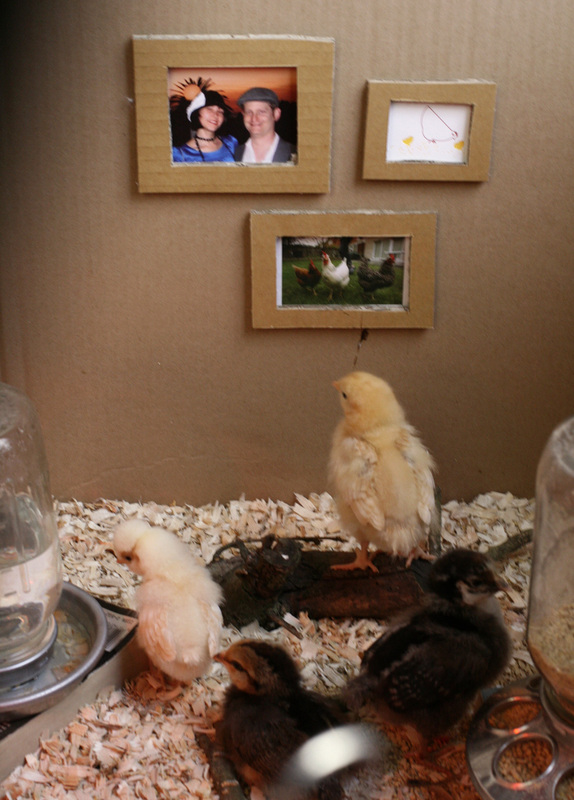 Because the little ones grow so fast, a brooder is an evolving space. But here’s a rundown of the basic setup we started with. 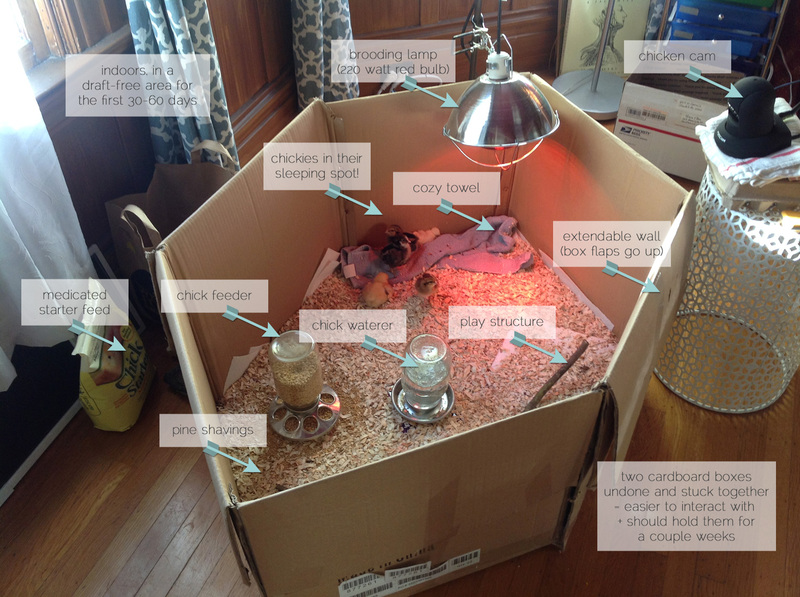 Even with a mama hen to keep the chicks safe and warm, a brooder and some of the components shown would be necessary (or at least desirable); it just might not need to be indoors. Obviously “wild” chickens do just fine without any of this stuff or human assistance—but my understanding is that there’s a pretty big attrition in unattended chicken flocks. We don’t want to lose a single chick, so everything here is set up to keep each and every chick happy and healthy into adulthood. Number one requirement is a red brooding lamp to fill in for a feathery broody hen. Ours is a 220-watt bulb in a clamp lamp with ceramic socket, and it stays on all the time. The temp at chick level should be around 90-95° Fahrenheit for the first week, so the lamp needs to be raised a few inches over time, but rather than rely on a thermometer, we let the chicks tell us what’s up—if they’re crowded up under it all the time, it’s probably too distant to heat effectively, and if they’re scattered to the edges and never fall asleep under the lamp, it’s probably too low. The red hue is less intrusive at night, and also prevents the chicks from picking each other (although we’ve not had much of a problem with that). According to pretty much all the backyard chicken experts, chicks require special nutrition in their early days, so a nearly-exclusive diet of starter feed is essential for the first several weeks. I have to wonder about this dictate a teeny bit since chicks raised under a hen outdoors will probably eat a lot more than just starter feed, but again, we’re optimizing for healthy chicks with no loss, so starter feed it is. We chose a medicated feed which is supposed to help prevent the chick disease Coccidiosis, but most experts seem ambivalent about this point; the main thing is feed that’s formulated for baby chicks, and doesn’t require grit for digestion. What everyone agrees on is that a chick feeder and waterer are essential. Chicks are just too teeny to deal with the large versions, and can even drown in adult waterers, and makeshift dishes get messy fast. We are all about sturdy materials and re-use, so we picked designs that use mason jars screwed onto galvanized steel bases. This also makes it really easy to see how full they are. The water is cleaned and refilled once a day, and we add a half capful of apple cider vinegar (read: probiotics!) to it to promote good gut health, although commercial probiotic and vitamin mixes are available too. The last major component is bedding/flooring. The first couple days we laid down paper towels (see an earlier pic here) because the chicks have a hard time walking on uneven surfaces but need something with grip to prevent splayed-leg. On day 3 we put down pine shavings, and we’ve added more now that they’re digging and scratching. Finally, a little about the container itself. Those who raise lots of chicks usually build something more permanent, but we knew this would be our only brood for a while so we went with good old free and disposable cardboard, and so far it’s been just fine. The thing to remember is that chicks grow—fast! While a Rubbermaid tub would be fine for a week or two, it wouldn’t hold five chickens at four weeks of age, so I opted for a little oversize in the hopes we’d only need the one iteration. We didn’t have a single box big enough, and squares are so boring, so I took two identical boxes, broke them apart at a side seam, and reattached them to create the six-sided monstrosity you see above. I kept the flaps attached but taped down with the intention of raising them up to provide more height once the little ladies get their wings and try to make a break for it. It’s a little odd, but I think the unique shape provides a nice nook for the heat lamp, lots of sides for spectators to peer into, and seems large enough to accommodate all the fun stuff we keep adding to enhance their chickhood memories. It also provides better angles for the Chicken Cam! Ben did some finagling to get a popular security camera to stream on the web, which you can of course peer at here. And home sweet home isn’t complete without appreciation for art and family!